An authentic, gothic reimagining of Robert Louis Stevenson' s The Strange Case of Dr. Jekyll and Mr. Hyde , told from the villain' s perspective, that takes readers deep into the seedy side of Victorian London and explores the nature of personality and of the subconscious Mr. Hyde is trapped in Dr. Jekyll' s surgical cabinet, counting the days until he will face capture and be forced to make the ultimate choice about survival. Over the course of four days, he thinks back on what brought him to this moment, and he finally has the chance to tell the story of his brief but marvelous life. 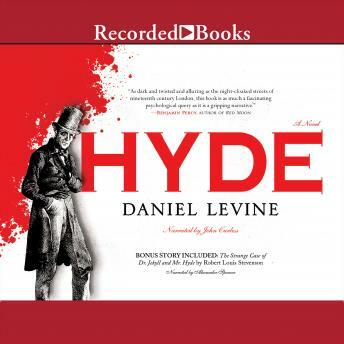 In liberating Mr. Hyde from the omniscient perspective of the original story, the author takes us inside the mind Hyde shares with Jekyll as he awakens after many years of dormancy, wide-eyed at being able to explore the world on his own. We feel the potions take effect. We tromp through the streets of London, drink gin in seedy pubs, we visit doll shops and menace the men who take advantage of the women there, and we attempt to rescue lost girls. We feel the strange distance of watching Jekyll' s high-class life through a membrane of consciousness. And then we feel the helplessness of someone being framed for serious crimes. The evidence all points to Hyde. Even if he didn' t intend to commit these crimes, is it possible that they have been perpetrated, without his knowledge, by his own hand?